Part One – London to Carlisle – Wednesday 6th June. As Sr Angela drove me to Euston Station the heavens opened in a heavy downpour of rain and I thought to myself “Is this a foretaste of what’s to come?” In fact, I had, of course already checked the 10 day forecast for Cumbria and things look a bit bleak for the next few days at least, plenty of cloud and rain showers every day – but I try not to let this thought dampen my spirits or enthusiasm. The train was very full, I guess many people returning north after the Jubilee celebrations. It was hard to find anywhere to put my luggage and in the end I had to leave it in the next coach, so that I had the horrible thought going through my mind the whole journey “what if someone decides to get off the train with my luggage?”. Paranoid, or what! Once I found my seat, which was supposed to be a window seat, I discovered that it had no window just a plastic column, so my only view of the passing countryside was through a tiny section of the window in front. I decided that a long sleep might be the best way to pass the time, so I put my ipod on and closed my eyes. 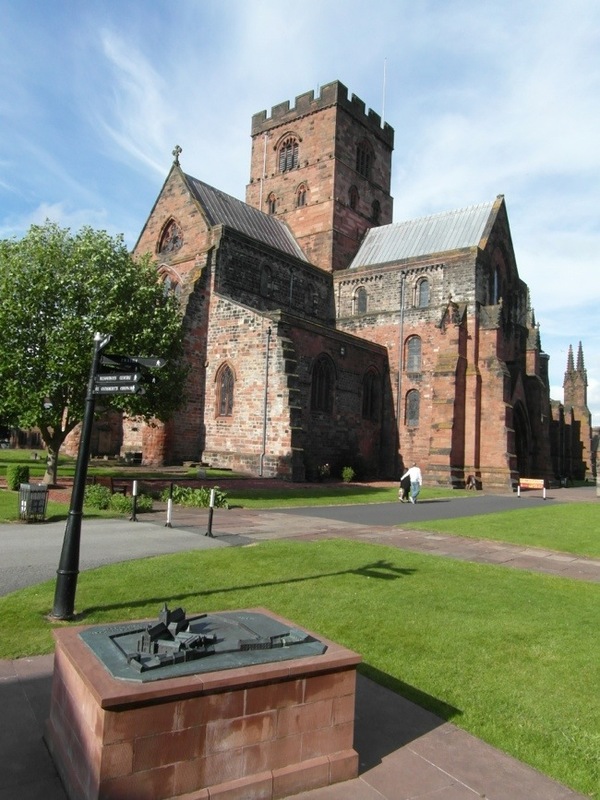 On arrival at Carlisle I made my way up the High Street toward the Cathedral Close, where I would be staying overnight with a good friend by the name of James, who is the Head Verger at the Cathedral. I hadn’t got very far when I saw James walking towards me, as he had just finished work at the Cathedral and was on his way down to meet me at the station. Later that evening we had a lovely meal at a nice Italian restaurant. After a relaxed morning pottering around Carlise, I caught an afternoon train down to St Bees. This train goes down to the coast and then passes through the West Cumbrian coastal towns of Maryport, Workington and Whitehaven, hugging the coast of the Irish Sea most of the way. The sea was very calm, hardly a wave at all. As the train pulled into St Bees the heavens opened in a heavy shower. Fortunately, it was only to few short steps to the B&B where I was booked in for the first night, Stonehouse Farm. As I arrived, I discovered that some of my fellow passengers on the traIn were also staying staying there and doing the C2C walk. There was a American family, and another American on his own. The C2C is a popular walk with people from all over the world. We exchanged a few brief greetings as we all checked in. I wonder if I will see them at the “starting line” tomorrow morning. After finding my room and sorting a few things for the morning, I headed down to the breakfast room as I had been told that they had Wifi there, and so I could write this blog. Tonight I will have dinner in a local pub and have an early night. I have booked breakfast for 7am, so that I can get an early start. I am excited about getting going, I have been planning this trip for so long, and now it is about to start. I am determined to enjoy it, whatever the weather may throw at me in the coming days. I am not sure if I will have a wifi connection the next couple of nights. If not I won’t be able to post my next blog until Saturday or Sunday night. This entry was posted in Coast to Coast Walk by shaun. Bookmark the permalink. It looks very sunny in Carlisle but I doubt you’ll ever be far from the next shower. Good luck, and I hope that the tea does its job! Glad to see you got under way & have arrived in Lakeland safe & well. Sounds as though you might have company along the way by the sounds of it, the forecast for the next few days isn’t to bad & I’m hoping the rain stays off as long as possable for you. Great blog by the way, I shall be looking forward to your forth coming entry’s. Hope your walking boots are waterproof and heavy enough to keep you grounded in the high winds and heavy rains. May God be with every step of the way and bring you back to us safely. Thanks for blogging, it’s great to follow you as you walk. I am sure you will meet many more interesting people along the way. Bet you won’t find that comedy too funny! You are doing sow well – we are proud of you . Hope the tea bags are working!